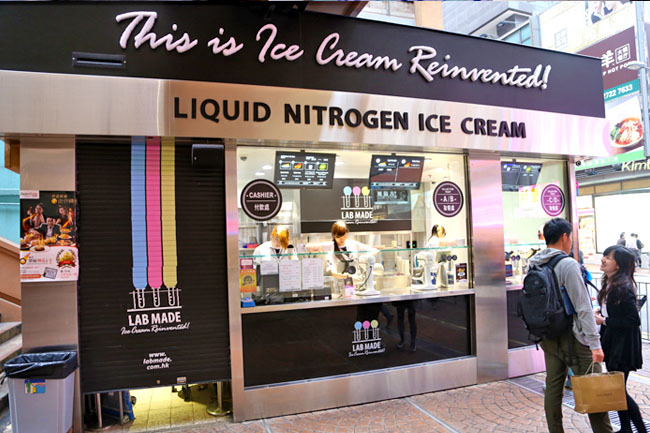 [Hong Kong] Lab’s Made Liu Sha Custard nitrogen ice cream is the bomb! 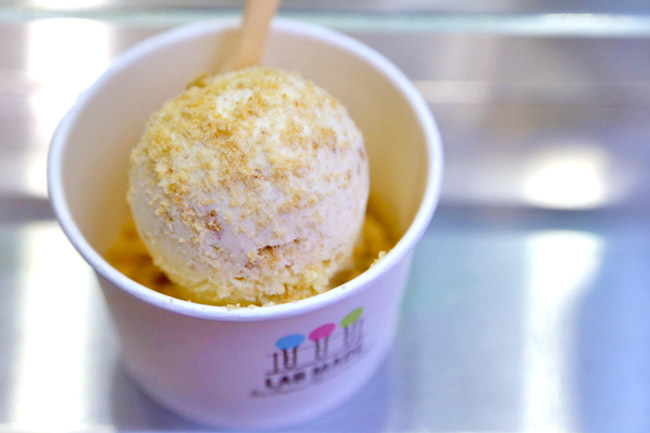 Creamy, dense, pulsating with salted egg yolk custard flavour, as though you are having the bun fillings, but cold. The bad news is, the flavour only comes once in a while. Good luck. Here’s how the science works. 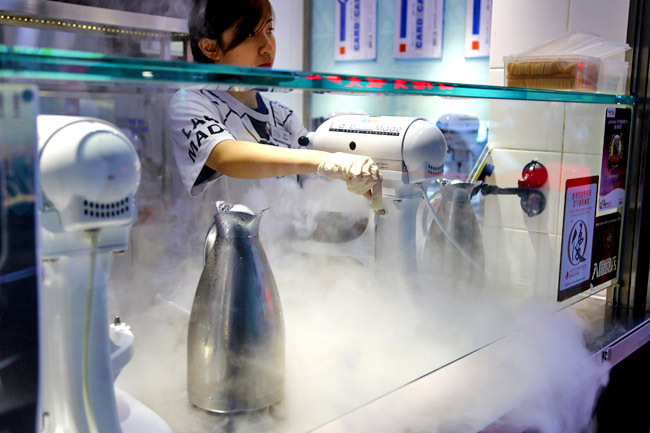 The liquid nitrogen technique freezes the ice cream to -196℃, resulting in smaller ice crystals due to the fast freezing, and thus smoother texture. 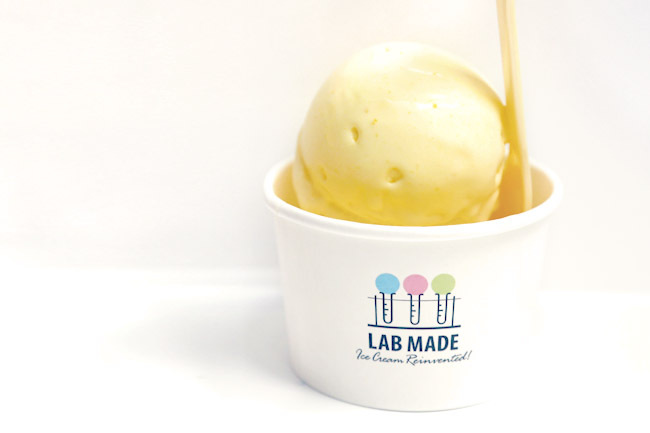 The usual commercial ice cream requires a longer time of at least 10 minutes to freeze. Lab Made uses a fraction at 60 seconds. Ice cream made to order. While waiting for about 2 minutes, you watch the gimmicky nitrogen gas dispense. They know their target customers, who can get bored and fickle with the usual flavours. There is always something exciting to try every fortnight, and you may need a long time (say months) for your favourite flavours to return. Apply Crumble, Mango and Coconut Rice, Crunchy Sea Salt Gelato with Caramel Sauce, Pandan Cake with Coconut, Red Jujube, Goji and Black Sugar, Super Lemon Meringue Pie, Crispy Banocolate, Rum and Raisin Cake, Tim Tam Chocolate, Rocky Road, Tofu & Black Sugar, Strawberry & Yakult, Lemon Ribena Greek Yogurt, and Chinese Beancurd Dessert. The flavours are so varied and different. I liked that they played with the strength of their culture, thus finding Hong Kong desserts such as “Liu Sha Bao” aka HK Custard Bun is intriguing while creating a sense of familiarity. On the flipside, some combinations could taste odd. 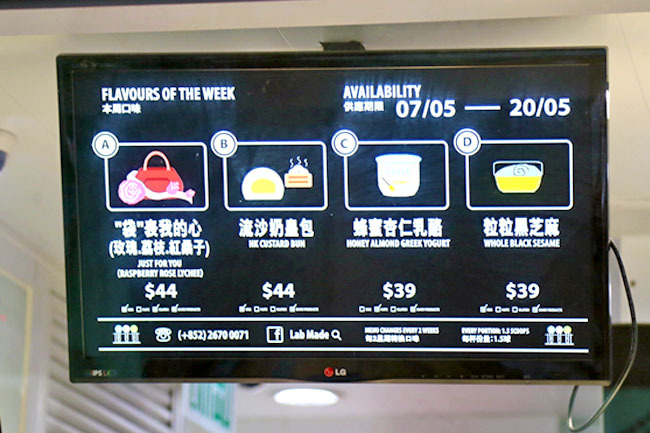 – Tseung Kwan O Shop: Food Kiosk No.3, 1/F, East Point City, Hang Hau, Tseung Kwan O, New Territories.